There are thousands of beautiful WordPress themes on WordPress.org, but finding right one seems to be a challenge. When searching for a WordPress theme, I expect it to be responsive for all devices, fast, SEO friendly and easy to modify. These features are available in lots of themes, you can also spend some money for a good premium theme according to your requirement. To make your search even easier for Top 10 Responsive WordPress Themes in 2018, we recommend you first to consider the feature you will need for your site. Here’s a list of the Top 10 Responsive WordPress Themes in 2018. All of them are fully responsive for desktop, mobiles, and tablets. Have a look at our chosen themes for Top 10 WordPress Themes in 2018. All these themes comes with variety of features and rated with 5 stars by the users. Daron is a beautiful and clean theme which is fully responsive on all devices. Its perfect for portfolio, business, corporate, bloggers, agency , consulting, travel etc. It also has support for WooCommerce. Aneeq Its perfect for business, freelancer, corporate, bloggers, Agency, Portfolio, consulting, WooCommerce, travel. everything you’ll need a full-featured business website. 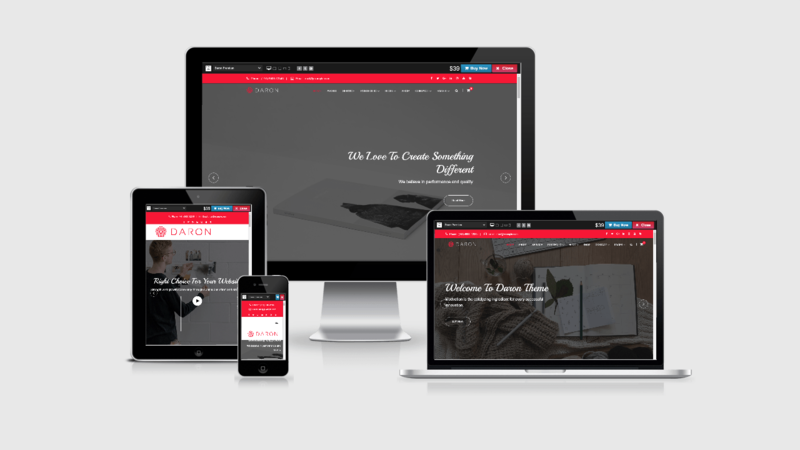 It’s a Perfect smooth and awesome responsive WordPress Blog theme. Sydney is a powerful business theme that provides a fast way for a company or freelancer to create an online website. It is fully responsive and compatible with Elementor builder. It brings plenty of customization possibility and much more. Flash is a minimal theme for business and corporate purpose theme with a simple one-page layout. It has A full-width slider and animated stats. Also, a clean customizing appearance that will make your services cool. Astrid can help you to quickly create a business website on WordPress. All the features you need are in this business theme. It has a color setting and many other interesting and useful settings. Hestia is a clean and awesome free theme that uses the latest design trends. It has a one-page design with scrolling and a modern look. Hestia also has an online shop, that borrows a bit of Pinterest design, and a featured slider. Latte is a modern theme for business sites. It comes with a smoother parallax scrolling, and full-width beautiful header, and simple look. It’s provides anything business clients need with best works. Bento is a universal free WordPress theme that offering wide customization opportunity and a set of powerful features that enables anyone to create a unique website of any type. Its has local business pages to large corporate and online shops. Also, It’s easy to use and follows SEO guidelines. SimpleShift A beautiful one-page theme for small businesses theme with a creative or corporate design. Also, modern and colorful look and a full-screen layout. Overall, It comes with quick parallax scrolling and an elegant design. Naturelle is an easy & simple theme. Its perfect for the who support the natural environment causes and for ecology websites. It is quick, modern, and has a one-page homepage layout. It also provides a cool parallax header and a simple customizer.